Leah Hogsten | The Salt Lake Tribune Skyridge High School running back Ma’a Notoa is back this season from a knee injury and has amassed over 1,000 rushing yards, Monday Oct. 15, 2018. He hopes to lead his team to a state title this year. Lehi • It’s late fourth quarter of a close game at Viewmont High School. The Skyridge High School football team is on the verge of its fourth straight win to start the 2017 season. Naturally, the Falcons turn to then-junior star running back Ma’a Notoa to make a play. Notoa receives the handoff and looks up the field. He sees a defender looking to make a tackle. Notoa has two options: turn the corner and run upfield, or cut inside the opposing safety. He chose to cut. He’s tackled. Notoa is known among his teammates as a tough player. No matter how hard the hit, he always pops back up. But he stayed down this time. His face filled with anguish. “We knew something was wrong with him,” said Ioholani Raass, Notoa’s teammate and brother through adoption. Notoa didn’t know. At least not yet. He left the game briefly, knowing something didn’t feel right in his knee. But adrenaline rushed through his body. He told the team he was fine because he wanted to help the team win, and returned to the game for a full drive. After the game, however, Notoa couldn’t walk. About two weeks later, he visited the doctor for an MRI. It revealed a torn ACL, MCL and meniscus in his right knee. Notoa knew his season was over. But the news cut deeper than that. He thought the football career he’d been nurturing since third grade was over, too. “I thought I was going to be just another kid who just had a dream but didn’t do anything,” Notoa said. The Falcons didn’t feel Notoa’s absence right away. In the team’s first game with Notoa on the sideline, Skyridge blew out its opponent. At the time, the extent of Notoa’s injury was unknown. He was actually cleared to play and dressed for that game. But it turned out the team didn’t need him. In a way, that game’s result was fool’s gold, Falcons head coach John Lehman said. “It was easy to say, ‘We’re going to be OK,’” Lehman said. But once the team’s schedule strengthened, the team found itself longing for Notoa — or at least a situation in which it could replace him by committee. Lehman said there were several games where the team’s offense stagnated. The coaching staff tinkered with lineups to find a solution. Eventually, the Falcons got their groove back. They made it all the way to the state championship game, but lost to Lehi. Throughout Skyridge’s entire run, Notoa ached to be out there with teammates. He said watching the Falcons fight for a state title wasn’t fun for him. But he showed up to every game, sat at the end zone in his BYU chair with his crutches by his side, and tried to be the best cheerleader he could. “Anytime we score, you see his crutches fly up in the air, and he’d be hobbling on one leg,” Raass said. It was the least Notoa could do for his teammates after they supported him throughout his arduous rehab process, which lasted from last October until August. There were times he felt frustrated, that he wasn’t getting any better. But his attitude stayed positive. But about eight months in, he started to feel himself inching closer to his old self. Notoa felt sick to his stomach as he prepared to step on the field for the first time in almost a calendar year. 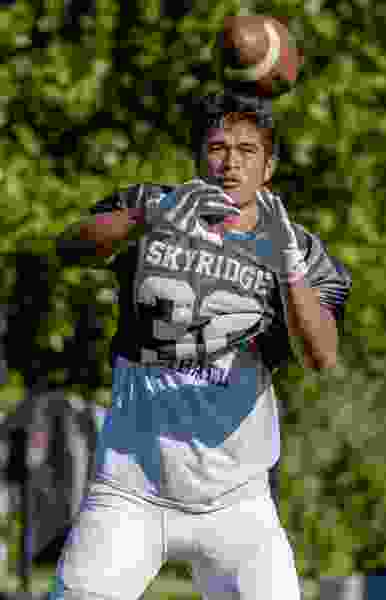 It was the first game of the regular season for Skyridge, and Notoa did not play in scrimmages over the summer or in another other type of competitive football until that night. Skyridge lost that game. Notoa got 80 yards on 21 carries. His father, Vai Notoa, who helped rehab his son, could see he still wasn’t completely comfortable. It showed in Notoa’s body language, Via Notoa said. It took two full games for Notoa to find his footing, to rediscover his confidence, to put his knee out of his head and focus on football. Since that first loss, the Falcons are on an eight-game winning streak behind Notoa’s 1,165 rushing yards. Lehman said much of the team’s success this season has been because Notoa is back on the field. Lehman said every local university in Utah has Notoa on its radar, and the senior running back has even made visits to some of them. But Notoa’s main focus right now is helping the Falcons win the state championship that eluded them last season. With Notoa back to full health this season, he is in position to do just that. “I definitely feel like I can help out a lot,” Notoa said.